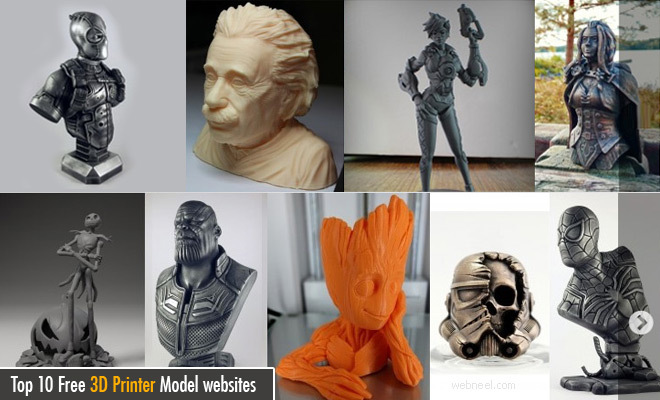 In this post we have listed top 10 best free 3D printing model websites. 3D Printers has made manufacturers life very easy. it allows them to create 3d models with minute details to understand the behavior and look of the 3D Models. We have a curated list of free 3d printer models websites, which allows user to download free models for 3d printer. The printable 3d Model sites are regularly updated with .stl files which are available for free and premium versions. There are numerous graphic designers across the world and these printable 3d model sites is a great platform for networking and sharing each other's idea. If you have a favourite, let us know. Cults is a marketplace that connects designers and people who want to 3D print some objects. At Pinshape, our mission is to make 3D printing simple and fun! We strive to provide our users an easy-to-use platform that lets them explore, share and download high-quality 3D printable designs. We created a massive collection of designs, all printable on consumer grade 3D printers. On 3DShook you can always find something for your home, your garden, your pets, your children or that special someone in your life. Yeggi is a search engine for printable 3D models. STLFinder is the most powerful 3d model search engine with more than 2,5 millions 3d models indexed from a wide variety of repositories all over Internet. MyMiniFactory, which launched in 2013, is the world’s leading curated social platform for 3D printable objects. Think of us like the YouTube for 3D printing. As an online community of nearly 5 million product designers, engineers, students, and manufacturing professionals, GrabCAD offers a wealth of useful information and knowledge – and we want to share the very best of it with you week in and week out! Founded in 2013 by electronics conglomerate, New Kinpo Group, XYZprinting is on an ambitious mission to integrate 3D printing into our offices, schools and homes for use in daily life. Sketchfab is empowering a new era of creativity by making it easy for anyone to publish and find 3D content online.